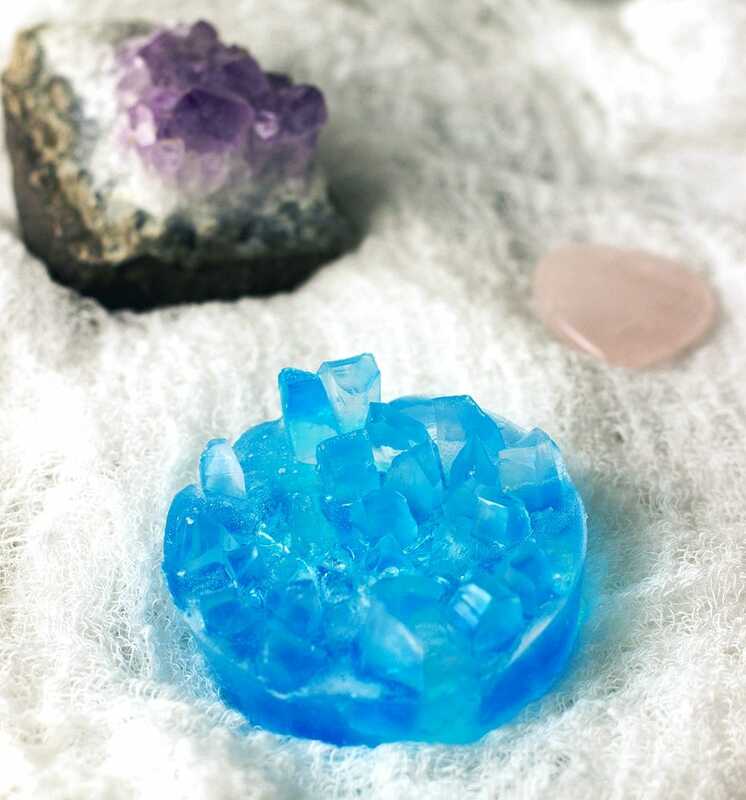 DIY crystal soap that looks like gemstones is the first of, hopefully, many magical projects to come. I don’t do a ton of DIY projects, so I am easily intimidated. However, I was forced challenged encouraged by my friend, Dawn at Cutefetti to do some magic-like creations. 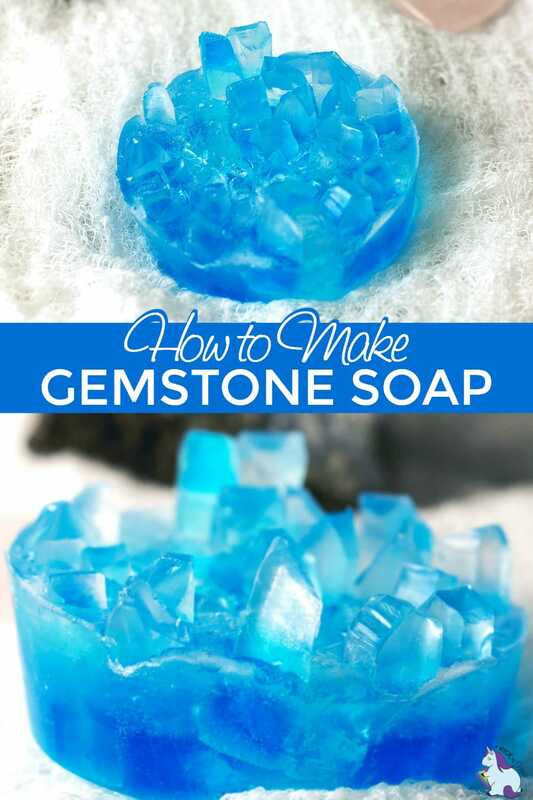 I headed on over to Google and found this DIY gemstone soap tutorial. It seems a little advanced-level for me, but her video makes it looks easy enough. Well, here was my experience. First off, I need to dig deep to find the patience for crafts. I try to tap into the therapeutic benefits of working to create something beautiful, but my mind likes to quickly shut that down. Second, I did this away from home, so of course, I forgot a bunch of things I needed. For example, I didn’t have a good tripod to create the video. But, I promised I was going to post all of this no matter how it turned out – magic or mess. 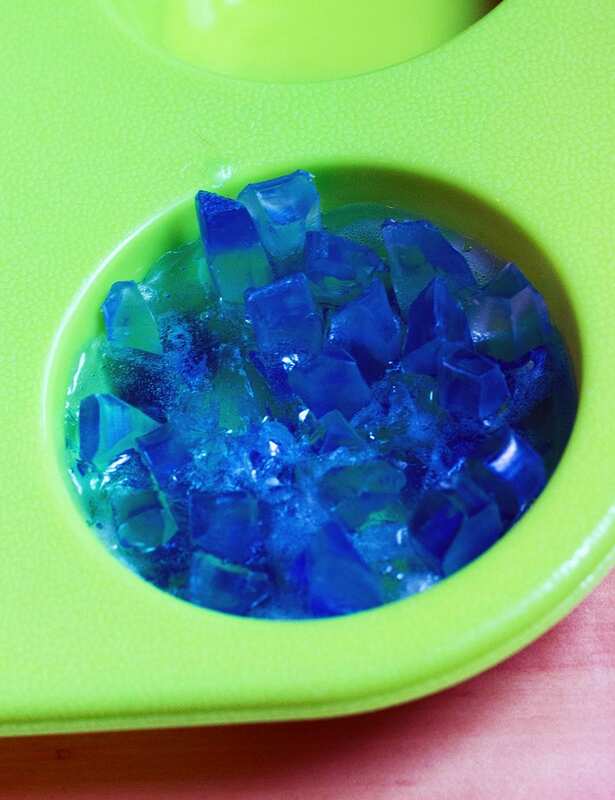 After I had finished the crystal soap, I have to say it wasn’t difficult. It was a bit time-consuming, but that was partly my inexperience. I would love to do it again with other colors. I used soap coloring, but next time I will use food coloring for more vibrant colors. 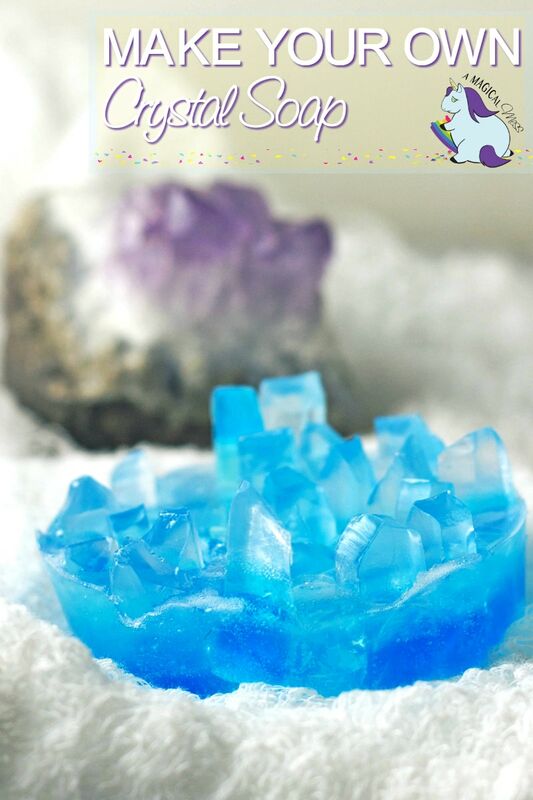 Homemade crystal soap makes an excellent and unique gift idea for anyone, especially if they are into crystals and gemstones. Play around with colors and even add some luster for shine. 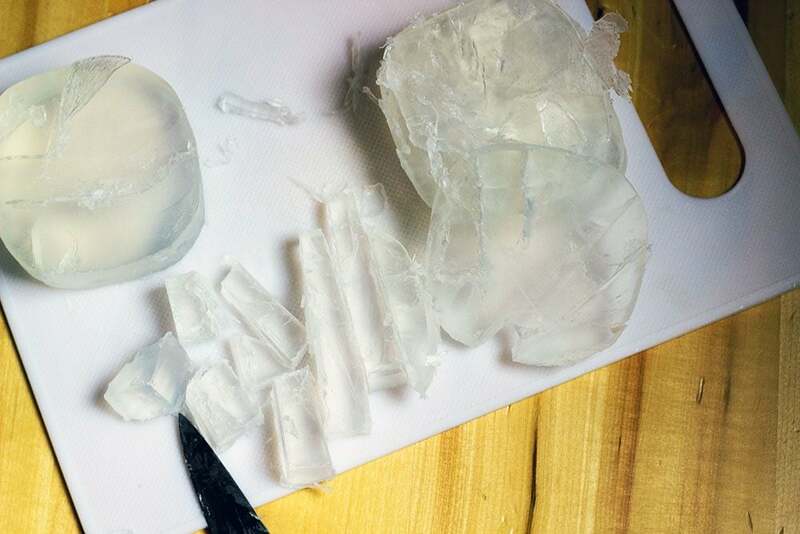 Carefully cut the block of transparent glycerin into chunks with a sharp knife. Put pieces into a microwave-safe bowl and heat. Keep an eye on it since it only takes seconds. Pour a thin layer into your mold, and leave the rest of the liquid in the bowl. Let the soap harden and cool in the mold. Texturize the surface of the hardened layer by lightly scratching with a fork. This helps the layers stick together. Reheat the bowl with the glycerin since it’s probably started to thicken at this point. Stir in your choice of essential oils and food coloring. This will be your second layer, so don’t make it too dark. Spray rubbing alcohol on the first layer before pouring the second layer. Pour the second layer and let harden. Reheat the leftover soap again if needed. Add more coloring to deepen the color. This is your third and darkest layer. Scratch the surface of the second layer and spray with alcohol before pouring the third layer. Allow to cool completely before popping out of the mold. 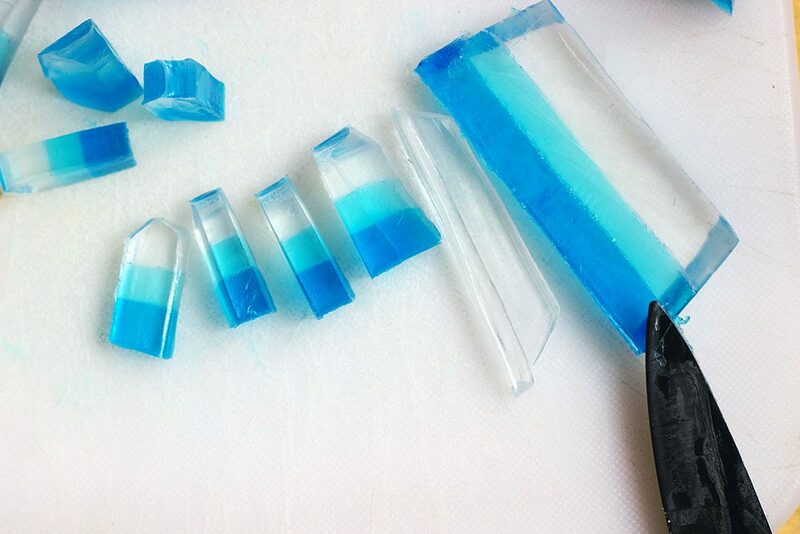 Take your three-layer soap creation and cut it into slices. Cut the clear ends at an angle to create triangle shapes. 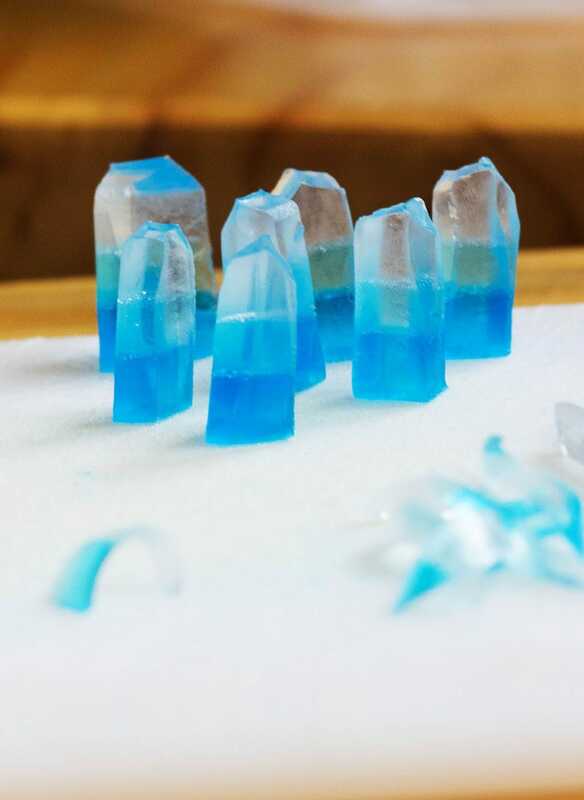 Slice into smaller pieces that start to resemble crystals. Continue cutting to shape your crystals into unique pieces. Save all of the tiny soap scraps. Cut them into even smaller pieces. 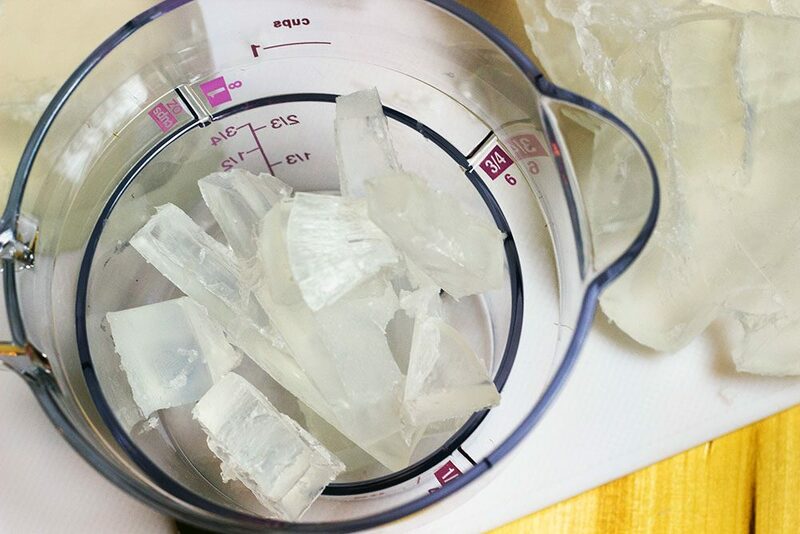 Take more chunks of the clear glycerin and heat it. Pour a thin layer into the mold. Quickly add in the tiny scrap pieces of soap first. Add the crystal pieces before the soap hardens. Let everything cool and harden completely before removing from the mold. This is where I lack artistic ability. I freaked out when the pieces fell down in the mold when, really, this is not something you want to look perfect. If you see a real gemstone, the stones are jutting out every which way. So, add the pieces in however you like. If some fall, it’s meant to be. If you are gifting the soap, consider brushing it with a little luster dust. It will wash away quickly but looks nice for gifting. So, I guess my color looks like aquamarine. 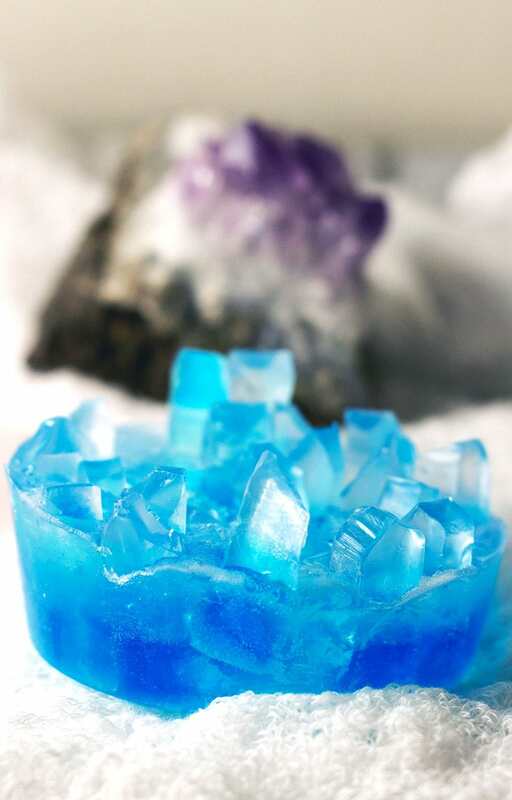 What kind of DIY crystal soap would you like to make? I am obsessed! These are so cute and would make an awesome gift. What a neat idea. This would make a great gift too! I love the final product. My science loving kiddos will have a blast helping me make these for some summer fun. 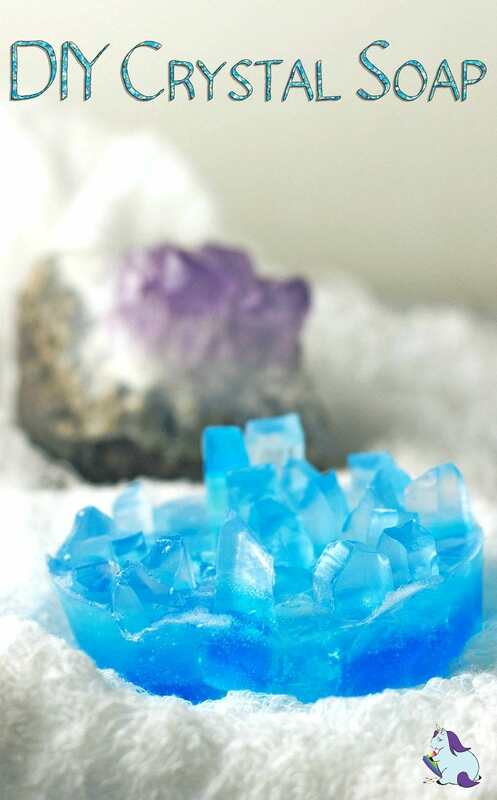 The DIY Crystal soap is amazing and the color is so vibrant! 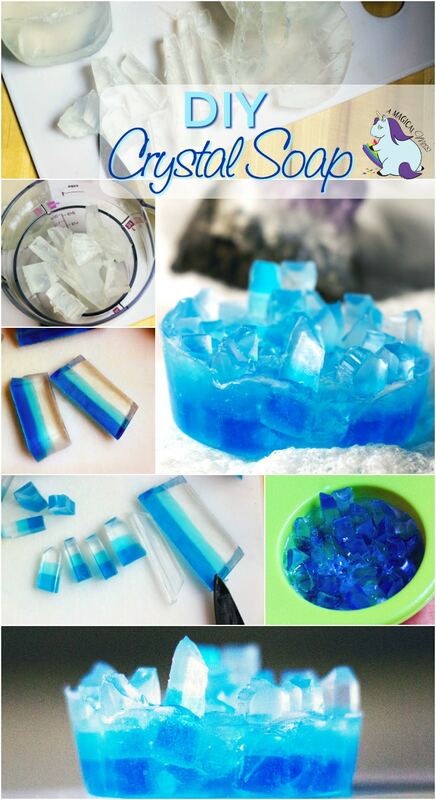 What a great idea and a fun soap to make with the kids! I love this diy. This would be a great gift idea. i love to ake this soap at home . i love hoq innovated it is and its kid frieendly. What a fabulous job! I’ve been professionally soaping for 5 years, and I can’t believe you’ve never done this before. You’re right. Handmade soap is not supposed to look perfect, that’s the beauty of it’s design. Well done! This is so cool! 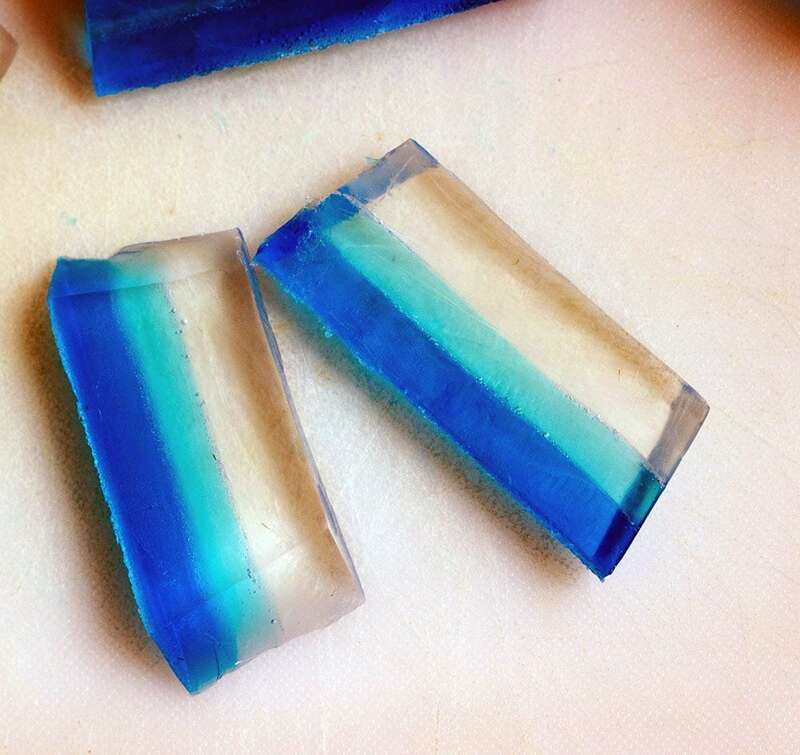 I’ve always wanted to try making my own soap but haven’t tried yet. This is very inspiring. i am going to try to get enough supplies for a classroom to make and find a teacher at my grandkids school to donate them to. That’s an awesome idea! Let us know how they turn out! !